Last night I showed my friend Paula how to make the crochet wire + bead necklaces that I’ve been creating since last spring. She came up with the idea of crocheting just the center part of the necklace and attaching a chain instead of chain-stitching the rest of the piece. I thought it was a great idea—it would be easier to control the length and the necklace would be less resistant to metal fatigue in the crochet-only areas (plus—less beads, less wire and less time!). I made the simple matching earrings for her. 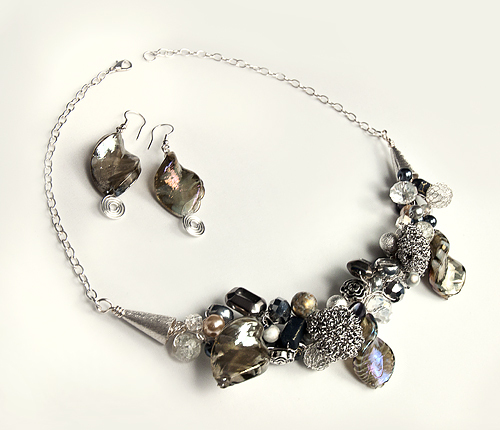 This piece contains beads made of glass, hematite, cracked glass, glass pearls and metal. Paula has lots of experience in wire-wrapping, bead stringing and other jewelry skills so I learn far more from her than she learns from me.